What are crystal promotional products? Crystal promotional products - usually engraved with a company&apos;s name, logo or message - include useful or decorative articles of merchandise that are utilized in marketing and communication programs. Engraved products that are distributed free are called advertising specialties. Engraved items given as an incentive for a specific action are known as premiums. Business gifts, awards and commemoratives are also considered promotional products. The most popular crystal promotional gifts are: paperweights, clocks, name plates, pen holders, business card holders, vases, diploma frames, picture frames, ice buckets. The benefits of engraved crystal promotional items. Customers appreciate unique promotional items of value. Crystal gifts are considered both classic and prestige. Items engraved with a positive personalized message promote customer goodwill and loyalty. 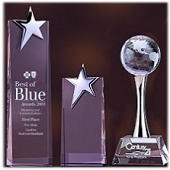 Engraved crystal items are often displayed on customer’s desk, thus enhancing corporate brand image. Promotional products are ideal for creating awareness among a selective audience. Customers reorder faster and more often when promotional products are used instead of coupons. How is the promotional products marketing used? Since promotional products can be used alone, or integrated with other media, there are virtually limitless ways to use them. Popular programs cited most often by industry counselors (called distributors) are business gifts; employee relations; orientation programs; corporate communications; and, at trade shows to generate booth traffic. They&apos;re also effective for dealer and distribution programs; co-op programs; company stores; generating new customers or new accounts; nonprofit fundraising; public awareness campaigns; and for promotion of brand awareness and brand loyalty. Other uses include employee incentive programs; new product or service introduction; and marketing research for survey and focus group participants.